I looked at our “guide” with disbelief and burst out laughing. 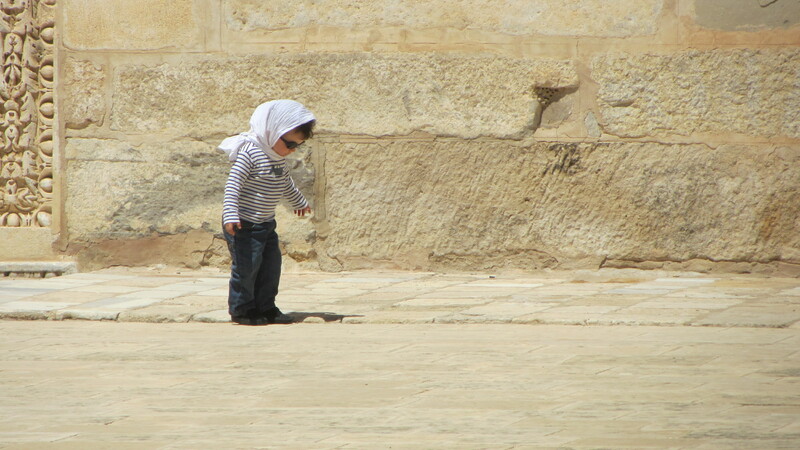 I was with my Finnish friend Heidi in Kairouan, a city that many Muslims consider to be the holiest in North Africa. Her blond hair and white skin struck a sharp contrast to my dark skin and somewhat Arabic features. Naturally, she attracted plenty of attention wherever we went, and her camel-endowed suitor was the latest in a long line of Tunisian admirers. I spent most of the 2-hour bus ride from Tunis to Kairouan showing off my much-envied talent of soundly sleeping on any kind of transportation. I did however wake up randomly for a few minutes, but this was enough time for the man sitting behind me to offer me some of his cake and almonds. As is the Filipino way, I politely refused around 3 times but eventually I gave into his persistence. I smiled at him and gratefully accepted his gift, popped it in my mouth, and fell asleep again. I awoke later as we pulled into Kairouan. The man behind me (hitherto shall be referred to as MBM because I forgot his name) was chatting in French with Heidi. We learned that MBM was returning home to Kairouan after completing his 3-day working week in the capital city of Tunis. He said that he loved foreigners and offered to show us to the city center since he was headed there anyway. Delighted at the chance to split a cab, Heidi and I accepted and arrived at the old town in a few minutes. Upon arrival, he insisted he would cover for the cab and hastily paid the driver before I could even get my change out. Classic Tunisian hospitality: they never let guests pay for anything. During my first two weeks here, I didn’t need to pay for a single meal or cab ride. They were so persistent in paying for my everything that I often left feeling embarrassed. To be treated multiple times a day really left me feeling extremely grateful and impressed with Tunisian generosity, but I still felt uncomfortable nevertheless. Too much of a good thing, huh? 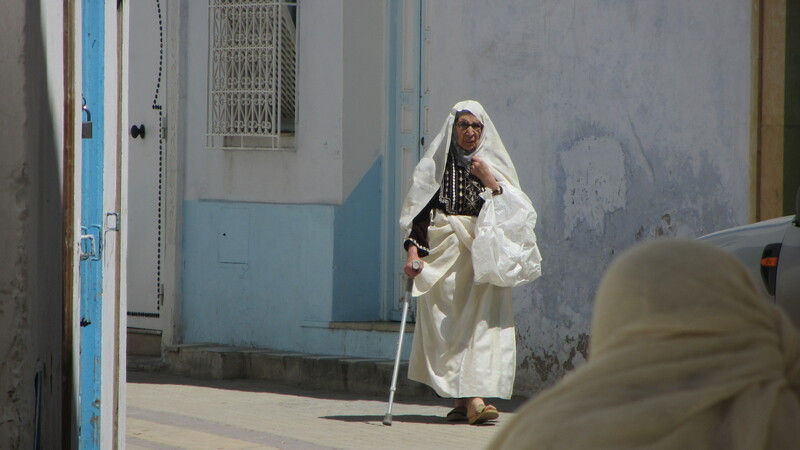 Once we disembarked from the taxi, MBM insisted on showing us around the medina of Kairouan. A classic ploy used around the world on tourists by locals. I readied myself to tip him a little after he showed us around. He sure did a lot of insisting. We walked around the medina (which is the old part of a city) for the next couple of hours. I was basically a third wheel to the unlikely pairing of MBM and Heidi. MBM kept on chatting with her in French, while Heidi tried her best to reply in kind. After an hour or so, she was obviously getting really tired of speaking French. Whenever Heidi and I would try to talk to each other, MBM would interrupt us and start up another conversation with her. MBM didn’t seem very interested in talking to me either, probably because I can’t speak the language and I’m not a blond girl. But I liked it that way; I was able to enjoy Kairouan without being distracted. And there was so much to enjoy. Kairouan looked like a city suspended in time. I felt like was plucked out of the world of electricity, internet, and airplanes and thrown into a world of ancient mosques, snaking medinas, and devout Islam. 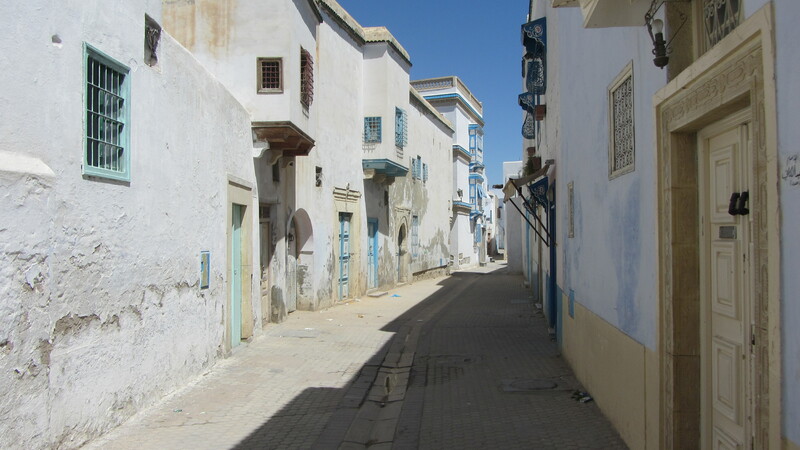 Everywhere you looked, there were people in traditional Arabic attire, unique architecture, and dusty streets. I half expected to a camel whenever I turned my head to look down yet another narrow alley. Kairouan is exactly the type of city I expected to see when I booked my flight for Tunisia. True, Kairouan does not strike awe into you in the same way that the Colosseum of Rome, The Great Wall of China, or Adriana Lima does, but this city is definitely a place to visit for those travelers who are after an authentic cultural experience instead of a trip to a white-sand beach that Tunisia is all too well-known for. I would even go so far as to say that a trip to Tunisia would not be complete with a visit to this ancient city. 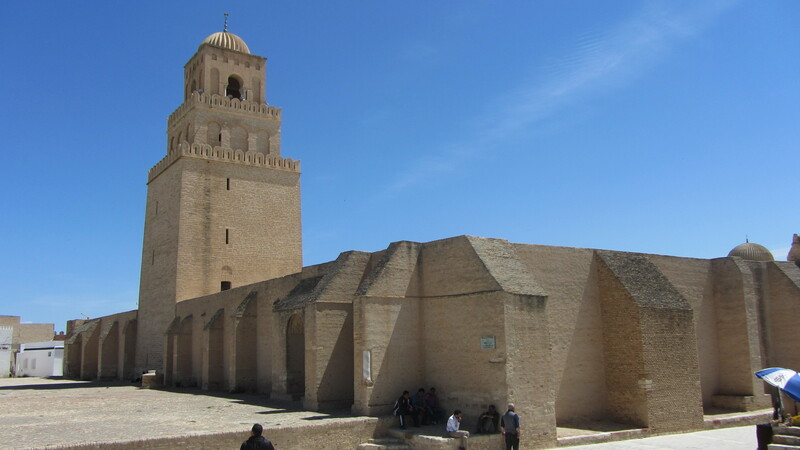 A mosque dating from 670 AD, the Great Mosque of Kairouan is one of the oldest places of worship in the Islamic world. Our improbable trio emerged a few hours layer from the medina with rumbling stomachs and tired feet. This is when MBM invited over to his house for a late lunch. I was a bit surprised, as this is not normally part of what informal tour guides offer. However, as nice as he appeared to be, Heidi and I knew better than to accept an invitation to a strangers house, even if he did just show us around for a couple of hours. After much arguing (well, Heidi was arguing since I conveniently knew only around 20 words in French), MBM finally gave ground and agreed that we could eat in a nearby restaurant. We knew he was going to offer to treat us (vintage Tunisian hospitality), so we pre-emptively tried to convince him that we could pay for ourselves. The gesture was made all the more charming because there couldn’t have more than 100 dinar (about 50 euro) in there. While that certainly is a good amount of money in Tunisia, it is a far cry from being a millionaire. Heidi also pointed out to me later on that MBM’s French wasn’t so good either, so he probably wasn’t very well educated and couldn’t be very rich. And he still agreed to treat a couple of strangers simply because “he liked foreigners.” There had to be a catch. The water that I'm drinking is from a holy well that supposedly is connected to the waters of Mecca. 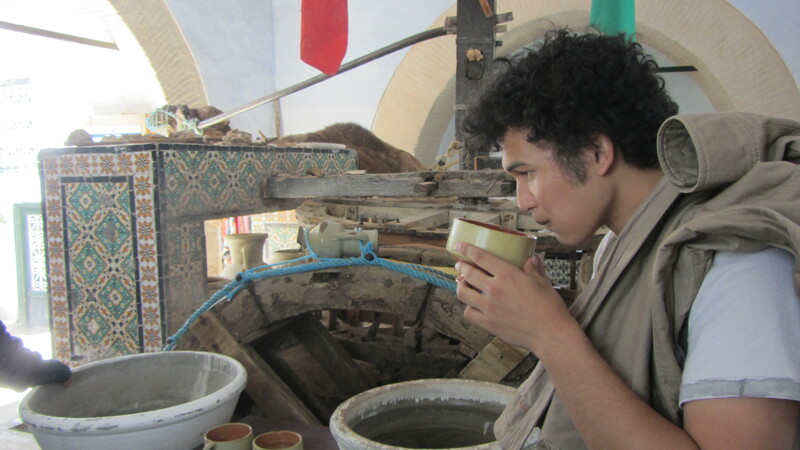 It is said that whoever drinks this water is bound to return to Kairouan one day. Over lunch, MBM and Heidi continued to talk while I sort of spaced out as I ate my food. When we finished, Heidi said its time to go. It was the moment of truth, this man had payed for our taxi, took almost 3 hours out of his day to show us around, and even bought us lunch. How much money was he going to ask for? However, instead of him asking for a tip as I expected, Heidi and I simply stood up, shook hands with MBM, and left. There was no catch. Just selfless generosity, plain and simple. During our visit to the beautiful Grand Mosque of Kairouan, MBM asked Heidi if she would consider converting to Islam after witnessing one of the oldest and grandest places of Islam. To further his case, he cited an example of a Russian woman converting to Islam after experiencing the solemnity and spirituality of the massive prayer room. For all of his efforts, in the end, Heidi gave MBM a wrong Facebook name. So much for pure generosity. There is always a catch. Oh, and the 5000 camels story? That was the second “guide” we had that day who wanted to marry Heidi. Blondes really do have more fun. I did a little research, and it turns out that an average camel is worth around 2000 USD. Multiply that by 5000, and I could have sold Heidi for 10 million dollars. That’s a pretty sweet deal.I figured I’d sell her next though when she brings her EU passport with her since I could probably get a couple dozen more camels if I throw that into the deal. Although personally, I’d take the camels instead of the money and become a camel herder in the Sahara. It’s the dream. This is the man who offered to pay me 5000 camels for Heidi. A quick story: he asked for Heidi's name along but completely ignored me and didn't ask mine. That's not the way to make a sale!